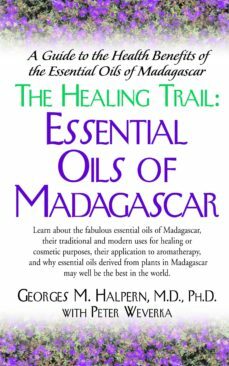 Essential oils, known for their healing properties as far back as ancient Mesopotamia and Babylonia, have reached their zenith in Madagascar, says Dr. Georges M. Halpern, author of The Healing Trail: Essential Oils of Madagascar. This interesting, informative, and clearly written new book is well-documented, with entertaining historical stories sprinkled throughout, including how eighteenth-century botanists succeeded in making this land a garden for botanical study. Madagascar, the planets fourth largest island, has long been famous for the individuality of its flora and fauna, and for the essential oils that many consider the best in the world. This book explains why and tells us what makes these oils so potent and effective. It details their use in aromatherapy, a healing method almost as old as medicine itself, and their many benefits to the perfume, cosmetic, and food industries; it describes the successful efforts of villagers to create a sustainable economy around them without having to cut down the rainforest, and offers practical advice for people wishing to visit this lushly beautiful island, "the naturalists promised land." Dr. Halpern gives the history and the chemical and botanical makeup of eight essential oils (for example, tropical basil, cinnamon leaf and bark, geranium leaf, ginger, and vanilla) and tells how they are best used to promote physical and emotional health. We learn where they are grown on the island, how they are cultivated, what studies are being conducted, and what scientists believe might be future uses for them.The Healing Trail: Essential Oils of Madagascar is an essential resource for learning how the unique aspects of this island have coalescedto create superior essential oils like no others on earth, and how these oils can be put to use for maximum benefit.